If anything is in the venue track that's all it does. Auto generate only works when it's completely empty, because it can't find anything. Make sure to use CAT to create play animations. i have them on each instrument. another thing is though i dont have a bass on the song that i charted so would that also be another factor in my problem? Do you have TitleUpate4 or are you on TU5? I dont get an error when compiling in magma which is the unusual thing and it also states that it is autogenerating camera cues in the log but i still dont get any. As you can see from the screenshot I was able to get passed the camera gen script in magma (even without the audio and art assets). So I wonder... you should either make a new magma project file (yours may be corrupt) and / or reinstall magma completely. Again I don't see anything wrong with the RPP that would mess with the camera gen.
so i decided to give up on my other custom that had this problem because i couldnt figure it out but my newer custom had the same problem with not autogenerating animations so i was destined to figure it out again. 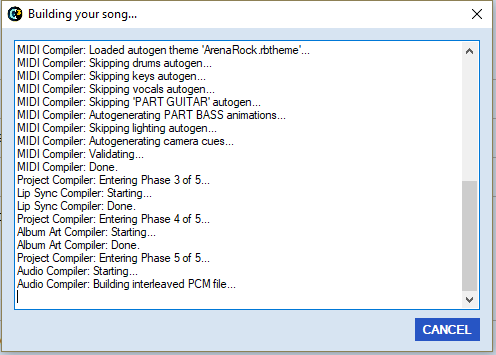 I actually found the problem and it has something to do with the keys in the song because i muted all the keys tracks and tried to build the custom without the keys that i charted and it actually allowed animations to generate. I have no clue why it does this and i am hoping someone can tell me how to fix this so i can allow keys to be in the song that i charted. thanks in advance!